Kula Collective began when eight friends came together to create a school that was structured around honesty, integrity, transparency, and love. Their idea was to create a crystal clear inner fractal that was so strong it had the power to expand outward creating an ever bigger fractal, spreading their ideals and thus raising the global vibration of consciousness. In order to promote the expansion of the Kula fractal, we have developed the Kula Ambassador Program. A Kula Ambassador promotes Kula offerings to their friends, students, local yoga studios, social networks and wherever else feels appropriate. You will have a unique code that will allow your contacts to receive discounts on all Kula offerings. And when your contacts signup for a Kula offering, you will receive rewards in the form of cash or Kula credit! $200 off any Kula Collective Yoga Teacher Training! Chance to win a free Yoga Teacher Training or Transformational Retreat! This prize will be awarded to our highest performing ambassadors that best integrate the Kula Collective vision and mission into their own Dharma. As the program expands so will the perks… stay tuned! Once your application is approved, we will send you a promotion kit to the mailing address you provide in the application. This will include postcards, bookmarks, and flyers with information about Kula Collective and Kula Collective Offerings. Each piece of promotional material has a space to write in your personalized promo code which you enter in your application. We ask you to spread these far and wide and let us know when your supplies are running low so we can send you more. Not exactly sure what a fractal is? Let’s look at a crystal as an example. Crystals grow in fractal patterns. If you look at the core of a crystal you will see a perfect shape. That shape is preserved no matter how much the crystal expands. 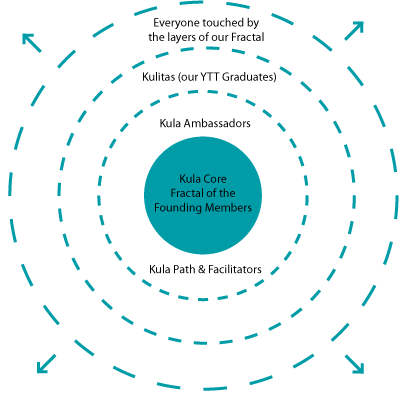 The perfect shape that Kula invests a lot of time and energy into is the relationship and agreements of the founders; this is our core fractal. The integrity of the core eight will emanate outward throughout all of the ripples of change that Kula creates. Kula Collective strives to create abundance for not just its founding eight members, but for the entire expanding fractal. As we crystallize outward we can create more opportunities and thus more abundance for our growing community. Giving preferred status to graduates for open teaching and healing positions in retreat centers owned by Kula Collective members. Centers include: The Yoga Forest, Present Moment Retreat and Seven Springs Retreat Center. Maintaining a Karma Program that offers grants and scholarships to students in need, provides creative consultations to membership organizations in training locations, dedicates time from each training to intercultural collaboration. Hiring Kula graduates as facilitators through the Kula Path for Yoga Teacher Trainings. Teaching high quality and spiritually based Yoga Teacher Trainings that provide graduates with a competitive advantage when searching for a yoga teaching position. Much thought has been given to the question: “How fast should the Kula Fractal grow?” In answering this question, two considerations seem imperative. First, the core fractal must be well designed and continually maintained. If there are any imperfections in the core, then the imperfection will radiate outward as the fractal grows, counter to Kula’s mission of increasing global consciousness. With this in mind, the eight founders have monthly board meetings and meet twice annually for an extended “crystal clear” retreat to ensure a harmonious inner fractal. Second, Kula can only grow if it attracts other high vibrational, like-minded people who will help to carry the collective mission forward... that's you! Thank you for being a part of our tribe. If you have any questions, comments, or concerns, please contact us! Together we can help love shine! Please fill out the following application and we’ll be in touch soon! Why do you want to be a Kula Ambassador?